RBTH presents a selection of views from leading Russian media, featuring differing views on the fate of an attempt by Ukrainian government forces to isolate pro-autonomy militias from the Russian border, and analysis of the dilemma facing Europe over imposing further sanctions on Russia. Gazeta.ru reports on the latest events in eastern Ukraine. The Ukrainian armed forces were preparing to blockade Lugansk several days ago, yet now the rebels are claiming that they may surround units that are loyal to Kiev in the next few hours. The rebels “will either have to break through with an assault or leave for Russian territory,” the publication writes. However, the Ukrainian side claims that it is purposefully cutting the militias off from the border zone. “Meanwhile, a full blockade of Lugansk is obviously being postponed, because the Ukrainian armed forces have not yet been able to close the blockade ring,” Gazeta.ru reports. Meanwhile, Petro Poroshenko has signed a law that grants combatant status to fighters participating in the anti-terrorist operation. This means that they will be entitled to the privileges that are legally afforded to veterans of the Afghan war, Gazeta.ru reports. Vedomosti, meanwhile, writes that the Ukrainian Army’s attempt to block the border with Russia seems to be failing. So far, Kiev has been unable to cut off the Donbass militias; troops are retreating and leaving the border crossings to the enemy. Citing a source close to the command of the breakaway self-proclaimed Donetsk People’s Republic, the newspaper writes that Ukrainian government units stretched along the border with Russia are incurring losses and have abandoned a number of checkpoints. Battles are under way in Marinovka, which houses a border checkpoint closed by the Ukrainian side in June. 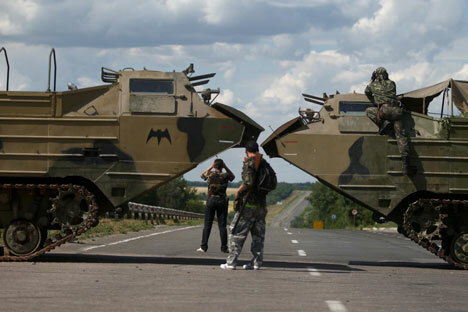 The militias also have control over the Izvarino border crossing. According to Reserve Colonel Viktor Murakhovsky, writing for the publication, in their attempt to regain control over the border from the south, the armed forces have started to experience difficulties with supplies, particularly food and water, and are also incurring considerable losses from shelling by rebels who have gotten hold of cannons and rocket artillery. According to Expert, the official reason behind the sanctions is Russian President Vladimir Putin’s refusal to completely fulfill the demands set forth by the EU to de-escalate the situation in Ukraine. Expert writes that the third package of EU sanctions is of the most radical kind: sector sanctions, which involve completely cutting off trade and investment ties with entire sectors of the Russian economy. Kiev is insisting on this type of sanction, and the United States supports it. “The Americans are putting blatant pressure on the European Union,” Expert writes. However, Expert is of the opinion that such a turn of events is only playing into Europe’s hands. The decision by the U.S. to impose unilateral sector sanctions against the Russian economy means European companies will be able to replace the outgoing Americans on the attractive Russian market. “Europe is facing an extremely complicated dilemma. It has to choose between pragmatism and image,” Expert writes. For many countries, the imposition of new sanctions may lead to significant economic losses, a drop in exports and possible gas shortages come winter, since sanctions will not only not help the situation in Ukraine, but might even seriously aggravate it, Expert reports. In the worst-case scenario, Europe might “simply lose its current leverage over Moscow.” After all, the key strength behind sanctions is the hope that even if they are not imposed, the simple threat of them will force the Kremlin to act with extreme caution.